Quite self-explanatory, on this graphic you will find 10 of the most revolutionary campuses across the US that have embraced green practices and technologies as for waste reduction, facilities, renewable energy etc. 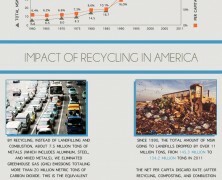 Americans seem to have done much as far as recycling is concerned. This graphic presents the amount of trash produced, the percentage of waste recycled, and the impact of recycling in America since the 1960?s. You know that “green” is good. But how much good does green-making return? 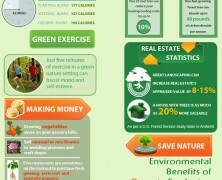 Benefits from gardening range from personal to communal. Get an idea of the trash volume produced in North America and why the adoption of sustainable, eco-friendly waste management methods are becoming a national priority.